I just finished a very interesting book on a little known aspect of World War II history. There have been many books on technological developments of World War II that allowed the Allies to when the war. For example, in ‘The Invention that Changed the World‘, Robert Buderi describes how a small band of scientists and engineers developed radar. This invention was the key advantage during the Battle of Britian. However, as a ham (radio amateur) of 50 years, I am always interested radio related technologies and ham radio contributions. 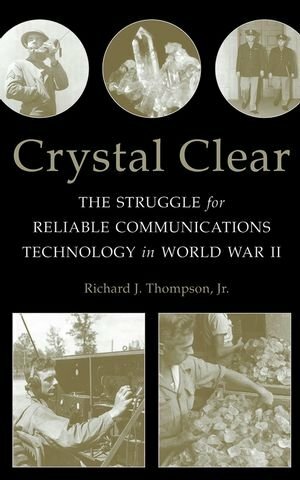 In his book, ‘Crystal Clear‘, Richard J. Thompson, Jr. describes how the development of military radio using crystal oscillators gave the Allies a major advantage. Prior to World War II the fledgeling crystal oscillator was dominated by one & two man companies serving the ham radio community and a very limited industry base. The outset of the war, the Signal Corps was still wrestling with the choice between crystal-based radios from this almost nonexistent industry and the more mature master oscillator design. The final decision swung to crystal design because of the poor stability of master oscillators in moving platforms such as armored vehicles and airplanes. Once committed the Signal Corps had the daunting task of creating an industry that could meet wartime demands. From only 100,000 units produced in 1941, the industry grew to produce 5.8 MILLION units in 1942 and a staggering 20.3 MILLION in 1943! As a direct result of using crystal oscillator radios the Allies were able to have reliable communications at all echelons of command. Allied Signal Corps men could rely on accurate frequency assignments when planning and executing operations across the world. The story of this amazing growth is one of unprecedented cooperation between the civilian government, the military and industrial rivals. The elements of this effort start with securing the only known source of radio-grade crystals in heart of Brazil to the hand delivery of critical crystals in support of important military operations. Posted: May 8th, 2014 under Books. Are we killing our bacteria friends? Full disclosure – in my youth I found Paul de Kruif’s book, Microbe Hunters, one of the most captivity books and for awhile considered becoming a pathologist. I eventually was captured by the electronic technology bug but never lost an interest in our invisible biology. This is important for Martin Blaser’s new book, Missing Microbes. If you are a germophobe or squeamish about the fact that we are colonized by billions of bacteria in every crevice of our body, inside and out, then this book isn’t really for you. However, if you are concerned about what may be happening to our bacterial ecosystem through the extensive and inappropriate use (Blaser position) of antibiotics in our food and as medical treatments; then you will find Missing Microbes compelling book. Blaser starts off modestly with some personnel history and evolutionary history of homo sapiens along with our bacterial brethren. The human microbiome that consists of 10 times more cells than our entire body and weighs a staggering 3 lbs! Blaser describes the rise of pathogens and our response with the creation of “wonder drugs”, antibiotics. Much of the book addresses our gut bacteria, H. pylori. H. pylori is the cause of ulcers and contributes to stomach cancer but also has therapeutic benefits! The book’s main theme is our use/over use of antibiotics in modern life and the implications for human health. For example, in our food, livestock are given large doses of subtherapeutic antibiotics for rapid weight gain. If this treatment works for livestock does it have a similar effect in us? Does ingesting these antibiotics in our food supply (use in the EU is band) affect our microbiome? I found Blaser’s description of the relationship between a mother’s microbiome and the birth process one of the most interesting discussions. Blaser roundly condemns elective C-section births and post natal antibiotic treatments as endangering babies for life of health complications. Blasser even addresses heartburn and acid reflux (GERD). Isn’t it fundamentally plausible that if we are impacting our microbiome with antibiotic use then there would be a price to pay in our digestive processes? In summary, Martin Blaser has laid out sound arguments based on his own studies (and others) that our indiscriminate use of antibiotics is contributing to many of modern maladies. The reader is cautioned however that Blaser does freely speculate and frequently extrapolates to more general conclusions than is supported by current data. In his defense, however, Blaser does indicate his opinion or the need for further investigations in these cases. It is left to the reader to carefully note these author speculations. Posted: February 26th, 2014 under Books. Common to both espionage teams was a strong determination to succeed, strong language skills, a dislike for military formality coupled with high creativity and flair for the unconventional solution. The book starts off immediately establishing British espionage leader’s courageous spirit by describing his solo WALK from Amsterdam to Istanbul in 1933 at age 18! In the course of this adventure, Patrick Leigh Fermor would master the Greek language and learn many lessons of getting along in strange lands. Shortly after the out break of war, Fermor’s knowledge of Greece came to the attention of the War Office and he was soon to return to familiar territory. However, the war was progressing badly for Britain, Greece and Crete were lost to the Nazi’s and Egypt was nearly lost. Another key player in the Crete espionage history was John Pendlebury. An archeologist and Crete expert prior to the war, Pendlebury established much the early intelligence network on the island. With his death early in the war, Pendlebury became almost mythical among the Cretan resistance fighters. Completing the complex tapestry of the Cretan espionage network were a motley group of British military, and Cretans. The Cretans are a particularly interesting group of peasants, monks, shepherds, farmers and the odd assortment criminals. What united all Cretans was a common history of opposing invaders whether they be Turks or Nazi’s. The account of the group culminates in the audacious kidnapping of the senior Nazi general in charge of Crete and spiriting him off to Cairo as a POW. In summary, ‘The Ariadne Objective’ reads more like a World War II spy thriller than the real life account of a courageous band of unlikely warriors. As with all detailed historical accounts in unfamiliar places, maps of Crete are essential. My uncorrected galley proof only contained a placeholder for these needed maps. I trust they will be up to the task in the final version of the book. By the way, In Greek mythology, Ariadne is the daughter of Minos, King of Crete. She is mostly associated with mazes and labyrinths. Her father put her in charge of the labyrinth where sacrifices were made as part of reparations. Given the part that the Cretan cave system played during the War, this was a very appropriate title. Posted: October 18th, 2013 under Books.